This note concerns the recent systematic review and meta-analysis by Sievert and colleagues on the effect of breakfast on weight in healthy adults published on January 30, 2019 in BMJ (1). We, a 70 -year old physician-patient with type 2 diabetes engaged in diabetes self-management for over 20 years and her endocrinologist, find the article quite valuable to clinicians, researchers and the public at large. Available data, not always of the highest quality, lead these reviewers to the conclusion that adding breakfast to the daily meals may not be a good strategy for weight reduction in adults as it can have the opposite effect. Specifically they state that breakfast consumption, compared with skipping breakfast, raises the total intake of calories. There is a direct remedy. Make it a moderate breakfast and raise the energy expenditure to cover the added calories. We, therefore, find it necessary to add a word of caution for the vast numbers of diabetes patients always on the lookout for effective strategies for weight reduction: skipping breakfast can backfire and leave us in worse shape overall because, regardless of its impact on weight, breakfast consumption offers real metabolic benefits to people with – or at risk for - metabolic disorders, especially diabetes (2-6). Mekary and colleagues show that skipping breakfast can increase the risk for diabetes (2). Kahleova and colleagues report that two big meals, breakfast and lunch, are better than six small meals for people with type 2 diabetes (3). Jakubowicz and coworkers find that a high-energy breakfast and low-energy dinner decrease overall daily hyperglycaemia in type 2 diabetes patients (4) and improve weight and different metabolic markers in overweight and obese women (5). The metabolic effects of breakfast are related to the hormone systems operational at the time of the meal and the fuel sources involved, along with the circadian rhythm itself. Counterregulation controls the metabolic activities of the body during the several hours of fasting through the night. Exogenous glucose is not available and the body uses other fuel sources, including free fatty acids, liver glycogen and muscle glycogen. What breakfast does is to switch the hormone system from counterregulatory hormones to the incretin-insulin system, and in 30 minutes or so exogenous glucose becomes the major fuel for the energy needs of the body. By this time free fatty acid levels have fallen and glycogen sparing is on in the liver and muscles. As a result, insulin sensitivity is the highest during the second meal of the day. (This is the so-called second-meal phenomenon (6, 7)). There are also data showing substantial diurnal variation in glucose tolerance in many diabetes patients: insulin resistance is worse in the evening, when people begin to wind down their daily activities (8, 9). The elderly patient has been under continuous glucose monitoring (Dexcom 5) since July 2017, following two harrowing episodes of seizures brought on by impaired awareness of hypoglycaemia. With the help of CGM, under the watchful eyes of her endocrinologist, she has been testing, among other things, how the diurnal variation in glucose tolerance affects her advanced state of diabetes. She would eat identical meals for breakfast and dinner and keep all other variables, including medications, total carb count (75 gm a day) and physical activity unchanged. (The carb servings are ¾ : 2: 1: ½ : ¾ ). Although the two meals, breakfast and dinner, are identical Breakfast PPG is a lot smaller than the dinner PPG (139 vs 193 mg/dL). Glucose tolerance is high at the second meal and worse at dinner (second meal PPG ~105 mg/dL). The remedy has been to take some carb (¼ carb) from dinner and add it to the breakfast. This improves the glucose profile. Most of the carbs (4 out of 5) in the daily meals are now consumed in the earlier hours of the day and glycaemic variability is lower. This result is in line with what the three previous studies have found (3, 4, 5). This low-carb balanced meal plan is compatible with the circadian clock. A 30 min walk after breakfast and/or after lunch can burn some calories, thereby moderate the glucose surge (10). Consumption of a healthy breakfast in this manner is helpful in weight management also. The Sievert review mentions that observational studies show positive association between breakfast eating and healthy weight in those who are in the habit of making healthy lifestyle choices including not smoking, moderation in alcohol intake and add more fiber in the meals. We would like to reassure people with diabetes and those at risk for metabolic disorders that eating a balanced, healthy, moderate breakfast can offer metabolic benefits and weight loss. Nature’s conservation laws forbid not just “free” lunches but food at all times that comes without the burden of weight gain. A practical message, therefore, to people with diabetes is this: eat a moderate, nutritious breakfast and go for a half-hour walk starting 30-minutes post-meal. Funding: This work received no specific funding. Duality of interest: The authors declare that there is no duality of interest associated with this manuscript. Author's contribution: Elsamma Chacko: Literature search, study design, data collection, data interpretation; put together the first draft. Christine Signore: Endocrinologist caring for the patient, devised the treatment plan, ordered medications, CGM and lab tests, interpretation and extensive review of the various drafts of the paper. It would be interesting to see a chart of the rise in obesity, heart disease, autism, mental disorders (ADHD, schizophrenia, and of type II diabetes since "breakfast has been advocated as the most important meal of the day in the media since 1917". There are lots of References in this unfunded, unbiased research of studies into breakfast vs no-breakfast for adults only. I appreciate that Big Corp and Pharma weren't sponsors. As far as I can tell though, there's no set breakfast plan; so no mention of what and how much they eat. Was it cereal, add sugar and milk, or eat bacon and eggs with home-fries, or a breakfast sandwich, and/or a donut? The types of breakfast methinks could contribute to results, and the research findings. Sievert and Hussain deserve congratulation for their systematic review, if only for highlighting the paucity of good research and the tiny sample size of most of the studies they looked at. While they comment on the high or unclear risk of bias of the studies, they omit clear mention of the potential impact of conflict of interest on the part of the authors. The only large study > 100 participants by Dhurandar et al (2014) states under conflicts of interest "The authors disclose that, although not for the support of this study, the authors or their institutions have received gifts, grants, or consulting fees from multiple organizations that market products commonly consumed at breakfast." In other studies showing positive effects of eating breakfast industry I noticed funding was received variously from Kelloggs, Quaker Oats, and PepsiCo, and the Institute of Life Sciences (recently noted by BMJ to be heavily sponsored by Coca Cola). As Tim Spector comments NHS guidelines currently recommend breakfast. Breakfast cereal is mentioned as a healthy choice. Yet what is it? Highly processed grain with added vitamins minerals and sugar, so very high in carbohydrate. It is also very effectively marketed. I myself (after personal experimentation) need breakfast to function optimally during the day, but haven't touched the processed stuff for years, as I was always hungry 2-3 hours later. We thank you for your comments regarding the search and possible omissions from our results. You have rightfully pointed out that a limitation of systematic reviews is that some relevant studies may be missed. We have acknowledged this in the manuscript and have noted this in our limitations section, indicating that we may have missed studies that did not mention energy intake or weight loss in the abstract. For this review we examined n=1868 titles and abstracts. The challenges of performing systematic reviews have recently been examined by Bramer et al. Regarding the specific issue of the study by Nas (2017) that Kate mentioned, we did not include this study because the title of the paper and the abstract indicate that the aim was to focus on the effect of breakfast skipping and dinner skipping on regulation of energy balance and metabolic risk. There was no mention in either the title or abstract of energy intake or weight measures. On examination of the full text of this paper, it was a study of 17 participants and in Table 2 they report that of the 15 who skipped breakfast, they had less energy intake (controls: mean 2283 sd 487 vs breakfast skippers: mean 2248 sd 486 (kcal/day), supporting the conclusions of our study. Importantly that study concluded that compared with consuming 3 meals/day, meal skipping increased energy expenditure. Kate Sievert, Sultana Monira Hussain and Flavia Cicuttini on behalf of the study team. Nas, A., et al. (2017). "Impact of breakfast skipping compared with dinner skipping on regulation of energy balance and metabolic risk." Am J Clin Nutr 105(6): 1351-1361. On behalf of out team, I thank those who raised interesting discussion points regarding this paper. We agree that skipping breakfast is not for everyone. Indeed there are some populations eg diabetic patients on treatment, where distributing calories over the course of the day may be advisable. However, there is no doubt that one of the major medical and public health challenges facing us is the obesity epidemic. We are not winning. It is important that as part of dealing with this challenge we question our beliefs about obesity. This study came about after I repeatedly saw patients with knee osteoarthritis who were obese, went to seek advice on what to do regarding their weight, and almost invariably were told they need to eat breakfast. A number would then complain that they were really struggling to eat breakfast, they just didn't feel hungry. It never made sense to me that we should be asking people to eat when they are not hungry. There are some people who love eating breakfast. Others who just don't feel hungry at that time. The key message from this meta-analysis is there there is no evidence that in order to lose weight, we should advise people to change their eating patterns to include breakfast. We found that eating breakfast resulted in an average 260 extra calories per day, and the average weight gain mirrored this, 0.44kg over an average of 7 weeks. One of the overwhelming responses to our study has been a relief among those who don't eat breakfast, that it is fine to skip it! 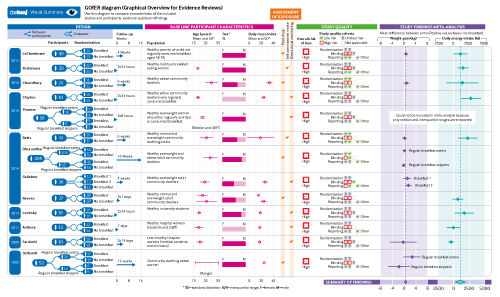 Re: Effect of breakfast on weight and energy intake: systematic review and meta-analysis of randomised controlled trials. But what about fibre and fasting? Missing breakfast loses an easy source of fibre, a thing we are commonly short of and increasingly seen as important both directly and indirectly via the gut Microbiome and the production of medium chain fatty acids, etc. Secondly there is increasing evidence that overnight -13 hr - fasting is good for breast and other cancers (1) and with an early start hard to do if eating breakfast. So pros and cons. It is not really what you call it but when you eat it. Intermittent fasting is used by many different peoples: some by design and others by need, but it is said to mimic the eating patterns of our ancestors prior to organized agriculture. In doing so we tend to exercise or work on an empty stomach which aids utilization of stored energy. Many call this diet LCHF; Paleo or Primitive but it seemed to sustain many hunter gatherers for thousands of years such that they seemed to have plenty of leisure time and good health. Many like me only eat within an eight hours window, mine from midday to 8 pm but any that suits one's lifestyle. As a dedicated Low Carb/High Fat eater for some ten years it sustains me and I rarely feel hungry. I often eat 'brunch' (at lunch time) or occasionally, when travelling, will eat a late cooked breakfast and then dinner about 7 pm. My weight hovers around 67kgs all of the time, give or take a half a kilo either way and has done for ten years. Breakfast is today more a sales opportunity for Big Food, helped by all of the Institutions of the State, who have colluded to the detriment of the health of our peoples, especially our children, to promote foodstuffs that were never meant to be eaten by humans. And not just breakfast cereals but manufactured fats/oils; milk from nuts (sic); so called 'smoothies' with more fruit than you would likely eat in natural form in a week, providing a fructose load that (with other sugar laden 'healthy' drinks), is contributing to the growth of NAFLD. Security Systems Engineer and Consultant. Human Biologist and Biochemist (failed).Patient Reviewer. It is disappointing that this week the BMJ has opted for a tabloidesque cover. This article throws some doubt on the ‘breakfast is important for dieters’ mantra but as the authors point out even in relation to this outcome the evidence is not conclusive. Regular meals, including breakfast, are frequently advocated as important in spreading glycaemic load in Diabetes and in reducing symptomatology in dyspepsia, although scrutiny of the evidence does not lead to certainty. Much has been written about the importance of breakfast for schoolchildren. In reality how does this help the GP to advise an overweight patient with DM and GORD, or an overweight young person whose grades have been falling off? The review and meta-analysis by Sievert et al may have made a small dent in the breakfast question but I don’t think it has been cracked, let alone smashed. Is the search strategy in the article "Effect of breakfast on weight and energy intake: systematic review and meta-analysis of randomised controlled trials" comprehensive? The authors should be recognized for including the complete search strategy for one of the databases they searched as supplemental material, in compliance with the PRISMA reporting guidelines. However, the search strategy may have some weaknesses, such as the use of subheadings in conjunction with subject headings, the use of the title index (instead of the textword or keyword indexes), and the use of phrases (instead of and or adjacency statements). The result of these choices is that some articles which may meet inclusion criteria are not retrieved by the reported search and may not have been screened. For example, Nas 2017 appears to be relevant, but does not appear in the search results of the reported search. Why not? I will explain with reference to lines 1-9 of the reported search strategy (the cluster of lines retrieving papers that address the concept of skipping breakfast). Line 2: morning meal.ti. -- while Nas 2017 does include the work "breakfast" in the title, it doesn't have the phrase "morning meal" in the title. Line 3: meal timing.tw. -- while Nas 2017 does include the phrase "timing of meal skipping" in the abstract, it does not include the exact phrase "meal timing." Line 4: Omitting breakfast.mp. -- while Nas 2017 does include the phrase "breakfast skipping," it does not include the exact phrase "omitting breakfast." Line 5: skipping meals.mp. -- while Nas 2017 does include the phrases "breakfast skipping" and "meal skipping," it does not include the exact phrase "skipping meals." Lines 6-9: eating habits.mp. or eating habits.tw. or eating habits.ti. or eating patterns.ti. -- Nas 2017 doesn't include the phrases "eating habits" or "eating patterns." As a result, Nas 2017 is not among the results of the summary statement in line 10, and is not among the results of the overall summary statement in line 23. I should note that the trial reported in Nas 2017 was indeed registered with clinicaltrials.gov as NCT02635139 and so could theoretically have been discovered by the authors when they searched trials registries for the word "breakfast"; that word is included in the clinicaltrials.gov study description and arms and interventions section of NCT02635139. Depending on which index the authors used when searching clinicaltrials.gov, NCT02635139 may or may not have been retrieved. This uncertainty underscores the importance of fully reporting even a simple, one-term query. I mention Nas 2017 as an example of a larger class: papers that are potentially relevant and which should have been screened, but are not retrieved by the reported search strategy. This individual paper may or may not meet the authors' inclusion criteria; the larger point is that the reported MEDLINE search strategy excluded it from consideration. Nas A, Mirza N, Hägele F, Kahlhöfer J, Keller J, Rising R, Kufer TA, Bosy-Westphal A. Impact of breakfast skipping compared with dinner skipping on regulation of energy balance and metabolic risk, 2. The American journal of clinical nutrition. 2017 May 10;105(6):1351-61. -	The between-group difference in weight change did not actually achieve statistical significance. Curiously enough, in one of the studies that reported separate results for habitual breakfast eating participants and habitual breakfast skippers (3), the subgroup used to have breakfast regularly gained weight while on breakfast whereas the subgroup habitually not having breakfast paradoxically lost weight while on breakfast. We believe that the authors’ effort may at most point out the need for further careful evaluation of the recommendation to introduce breakfast in hypocaloric regimens for obese people who are not used to have it and might thus increase their overall energy intake. On the other hand, it would be quite inappropriate and totally misleading to generalize these weak study findings to the general population, as unfortunately the article title may suggest. The bulk of the available evidence in fact supports the beneficial role of the regular consumption of a healthy breakfast with regard to overall adequacy of the diet, to the cardiometabolic risk profile, to the risk of diabetes and even to cognitive performance, especially in youth (4). 4. Chaplin K and Smith AP. Breakfast and snacks: associations with cognitive failures, minor injuries, accidents and stress. Nutrients 2011; 3: 515-528. Valeria Del Balzo, Department of Experimental Medicine, Research Unit of Food Science and Human Nutrition, "Sapienza" University of Rome, Rome, Italy.